Today we’re discussing You Learn By Living by Eleanor Roosevelt. We both enjoyed this buddy read for Nonfiction November. Because Roosevelt offers advice and anecdotes, this whole conversation is spoiler-free. In fact, it’s an easy one to listen in on even if you haven’t read the book because our discussion is both thematic and personal. We also answer a listener question about juggling multiple reads and share a little bit about how to participate in Dressember next month. 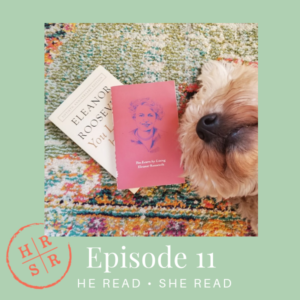 Find our bonus content, monthly newsletters and reading wrap-up episodes on Patreon: www.patreon.com/hereadsheread.